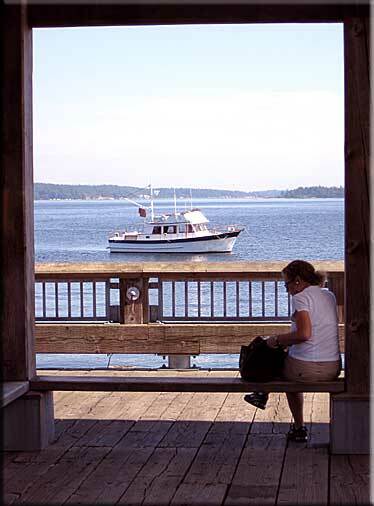 to running along the Hood Canal and continuing to Port Angeles, WA. Tide flat on the Hood Canal. 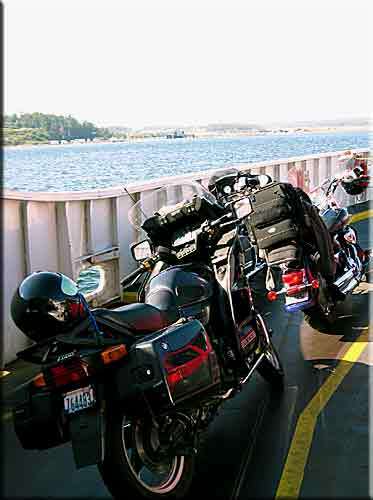 On a hot day in June, 2009, my Navy friend, Lope, and I, rode motorcycles on the two hour ride from Anacortes through Everett, Seattle and Tacoma to the new Cabelas sporting goods store near Olympia. To the uninitiated, Cabelas, for years, had the world's largest sporting goods store, in Nebraska. Travelers would detour to this out of the way post to pick up obscure pieces of equipage for hunting, fishing, bull riding, or training field dogs, to name just a few specialties. Recently, Cabelas has opened a few additional stores. After wandering the store, somewhat amazed, I picked up a few fishing trinkets. Lope headed back up Interstate 5, and I went west out of Olympia and followed Highway 101 up the west side of the Hood Canal towards Port Townsend. 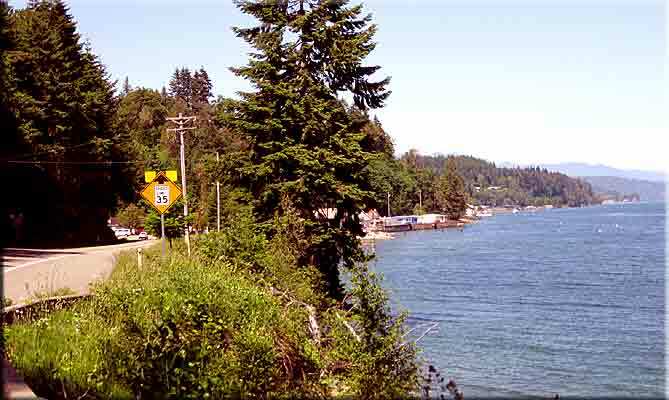 The Hood Canal is a 65 long tongue of salt water which separates the Olympic Peninsula from the Kitsap Peninsula. It also terminates the east-west Olympic Mountains, a rugged range of coastal mountains which capture huge amounts of snow in the winter and rain in the summer. The town of Shelton is a logging town, where for a century the logs could be easily rafted to the expansive mill and the lumber put on ships for destinations around the world. There is still a mill, but logging has slowed down. Now Shelton mostly provides shopping for the Indian reservations and for residents living among the mix of mountains, woods and water. About 20 miles north of Shelton a trailer with a smoker and a sign saying, "BBQ," caught my eye. I carefully rode my motorcycle across the gravel parking lot, and sat under the canvas awning at a picnic table. I asked for a half slab of ribs, as the place just had an authentic feel. The old proprietor walked slowly to an outdoor refrigerator and pulled out a cold, precooked, slab and cut it in half. As we made small talk he microwaved it until the last bit of moisture sizzled out in angry steam. I started separating the first rib and the prongs of the plastic fork immediately melted. When I tried to pull the ribs apart, I burned my fingers. Seeing my difficulty, the old man asked his wife to get me a paring knife from the trailer. It was too dull to easily cut through the dry meat, but I was able to slowly pull the ribs apart. As I gnawed on my jerky they said they were going to a funeral on the reservation that afternoon. It seemed that most of their Indian friends had passed on since they had moved here. I asked how long they had been here and they said, "20 years." I learned that they sometimes had bear and maybe a cougar. They talked about their boys in California and one in Seattle, and a grandson who was going to see his father this summer. I licked the sticky off my fingers, put in my earplugs, donned my helmet, and headed off. As I rode the two lane highway, I had cabins and blue water to my right, and deep woods and steep Olympic Mountains to my left. A profusion of state, national and private campgrounds lead off from this road, so many that even in the summer it is easy to find a spectacular place to pitch a tent or park and RV. On this day the road was busy with day trippers and vacationers. However, from October to April it is usually very quiet. I got to Port Townsend in time to see the Fountleroy Ferry leaving for Whidbey Island, so I had ample time to grab an iced mocha and wander among the old brick stores that line the waterfront. The residential part of town sits on a hill just behind the commercial area and consists of mostly old Victorian homes, many of which have been beautifully restored. During the half hour ferry crossing I watched seals, dolphins and sea gulls work the herring balls. 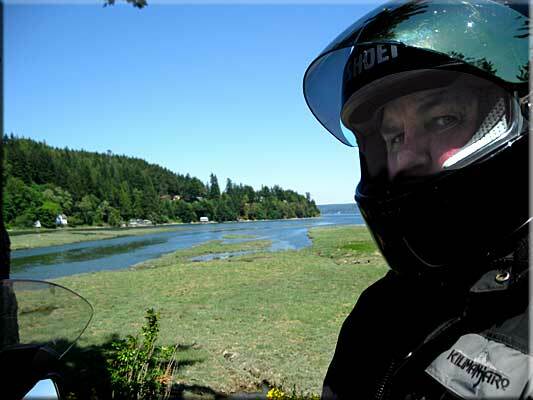 Back on Whidbey Island, I rode north through Oak Harbor, then continued across the Deception Pass Bridge onto Fidalgo Island, and 15 minutes later was home. 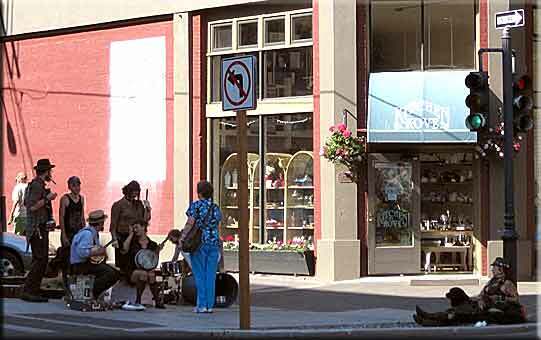 Port Townsend; a street band. 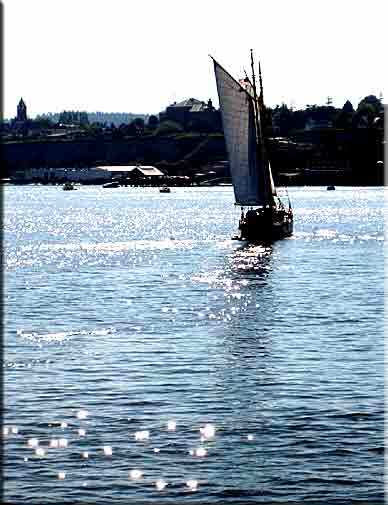 A gaff rigged schooner sails back into Port Townsend. 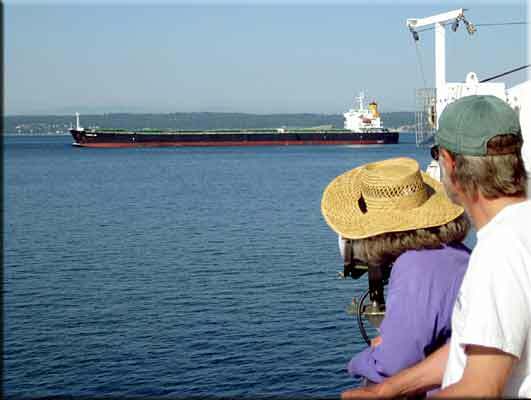 Fountleroy Ferry passengers watch a Russian tanker ply the straight between Port Townsend and Whidbey Island. Approaching Whidbey Island. My venerable 1993 BMW K1100LT in the foreground.